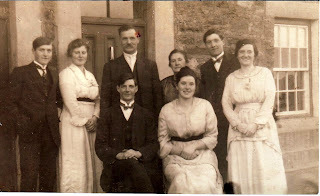 A photo of my grandparent's wedding on November 2oth November 1920, at westgate PM Chapel in Weardale. The bride & groom, seated, are Ernest Scown and Isabella Elliott. Her parents Harry & Annie Elliott are directly behind. Not sure of the others, I think they are some of her brothers & sisters.